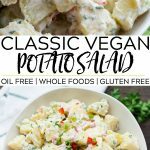 Classic Vegan Potato Salad, just like mom used to make but better for you! Perfect for potlucks or summer barbecues, and no would will guess it’s vegan. 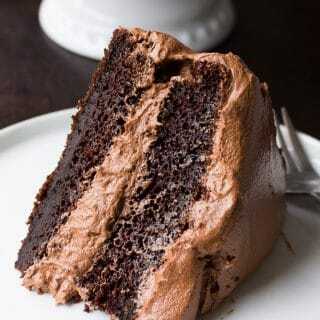 Oil free, gluten free and super creamy! 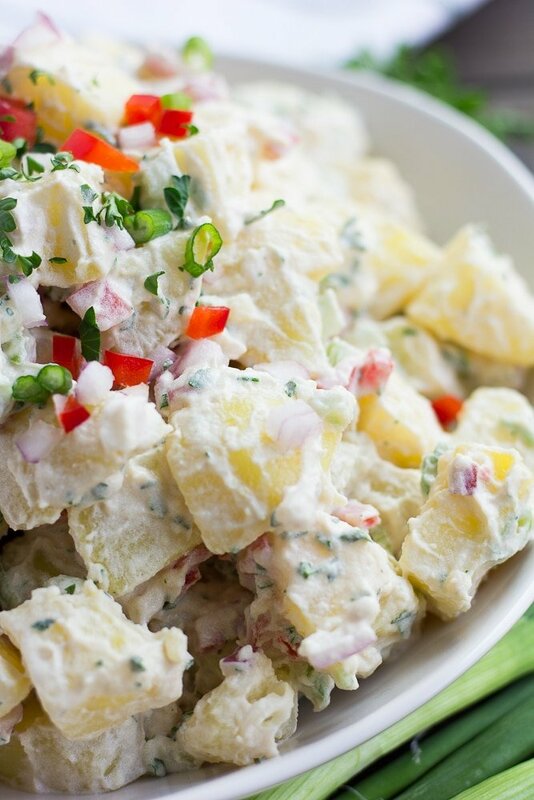 I have been making this vegan potato salad for at least 6 years now. I just sort of developed it according to my own tastes (long before this blog was in existence). I have brought it to countless barbecues and potlucks, and it never ceases to impress people! 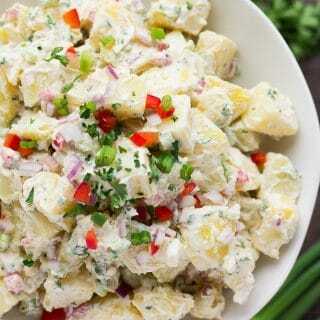 I’ve had several people tell me they don’t usually like potato salad but this one they love. 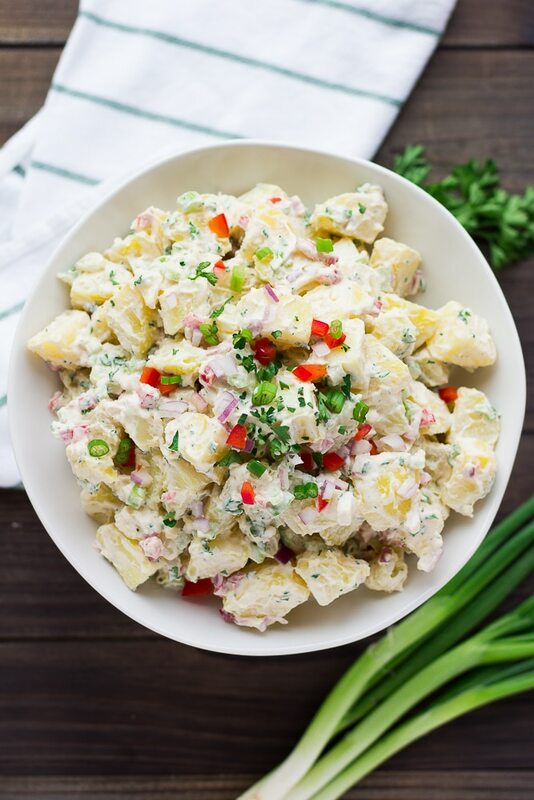 This Vegan Potato Salad will wow any crowd; it’s one of those dishes that no one will guess is vegan if you don’t tell them! It’s super creamy and has those classic flavors you’re used to, but without any of the animal products. Another bonus: It’s oil free and made with good-for-you ingredients! 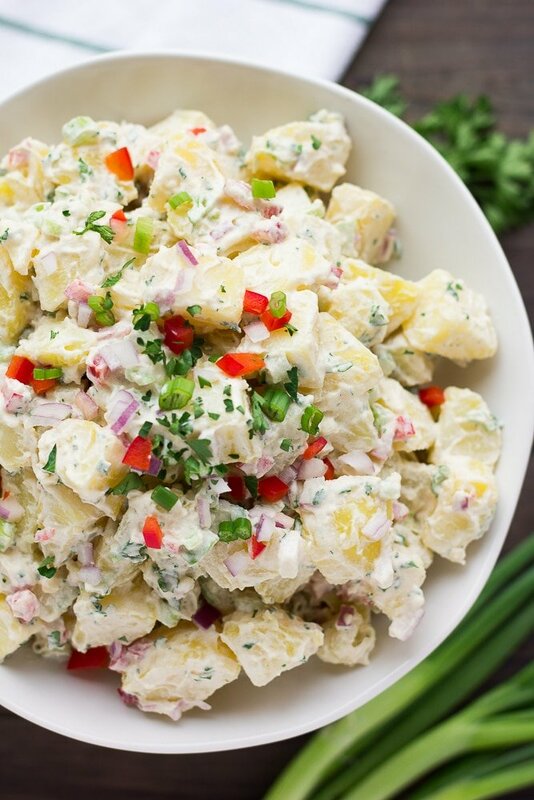 How do you make vegan potato salad? 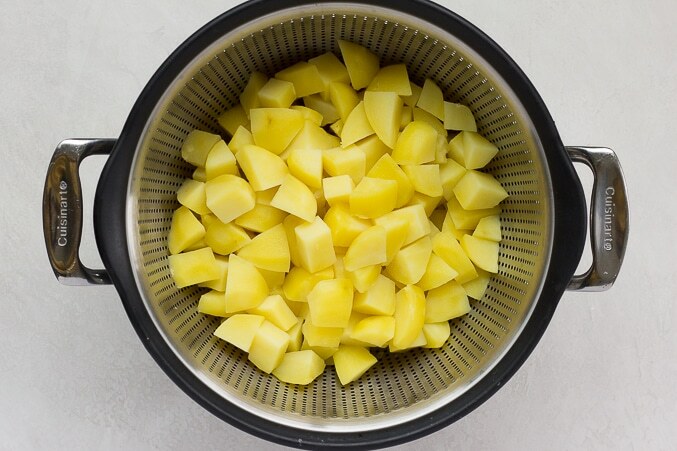 Start by chopping all of your vegetables, including peeling and chopping the potatoes. It will be easier to have everything prepped and ready. Next, make the Cashew Mayo. Soak 1 cup of raw cashews for 5-10 minutes in hot water (I use my tea kettle to heat up water, then pour it over the cashews in a glass measuring cup). You could sub vegan mayo if desired, but it won’t be oil free anymore. Drain the cashews, then add them to a high powered blender (you really need one to get the mayo smooth and creamy, a regular blender or food processor does not work very well), along with the lemon juice, salt, apple cider vinegar, mustard and 1/2 cup water. 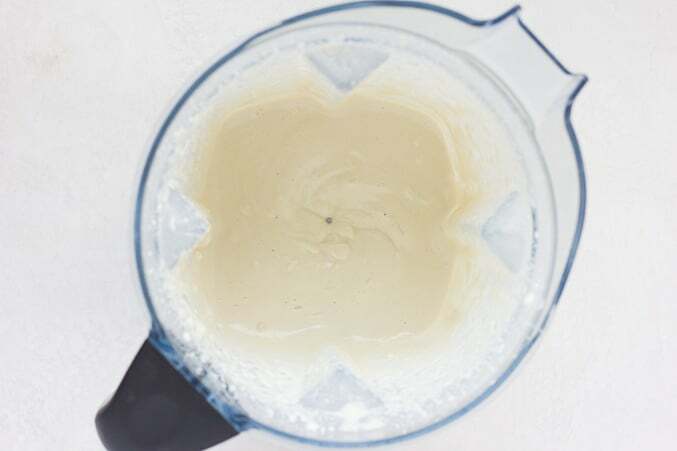 Blend on high until very creamy and smooth, scraping the sides as needed. Set aside. Now add the potatoes to a pot and cover with water. Bring to a boil and cook for 10-15 minutes, until fork tender. Drain in a colander. Now add the potatoes, all the vegetables and the cashew mayo to a very large bowl. Mix well with a large wooden spoon, and then refrigerate for a couple of hours so they flavors can mingle and it can get cold. Feel free to switch up the vegetables to suit your personal tastes. If you hate red peppers, leave them out or add some shredded carrots instead. If you aren’t a huge “onion” fan, leave out the chopped red onions, they are totally optional. 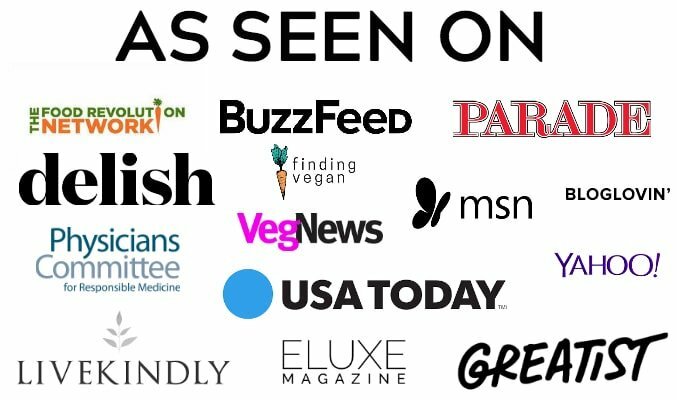 Want more vegan barbecue/potluck recipes? 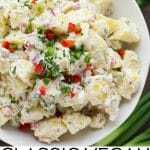 Classic Vegan Potato Salad, just like mom used to make but better for you! Perfect for potlucks or summer barbecues, and no would will guess it's vegan. 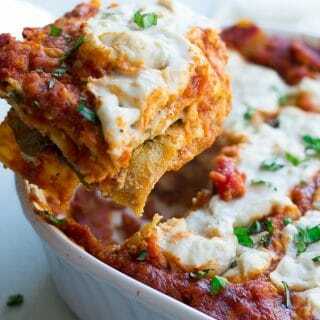 Oil free, gluten free and super creamy! Bring a few cups of water to a boil (I use my tea kettle for this). Add 1 cup of cashews to a measuring cup and pour the boiling hot water on top to cover. Let them soak for 5-10 minutes, then drain them. 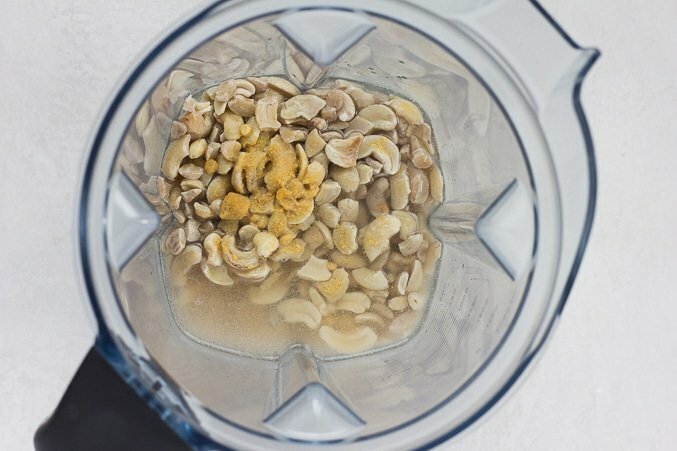 To a high powered blender, add the soaked cashews, lemon juice, salt, apple cider vinegar, ground mustard and 1/2 cup water. Blend on high until smooth, scraping the sides as needed. Set aside. Add the chopped potatoes to a large pot and cover them with water. 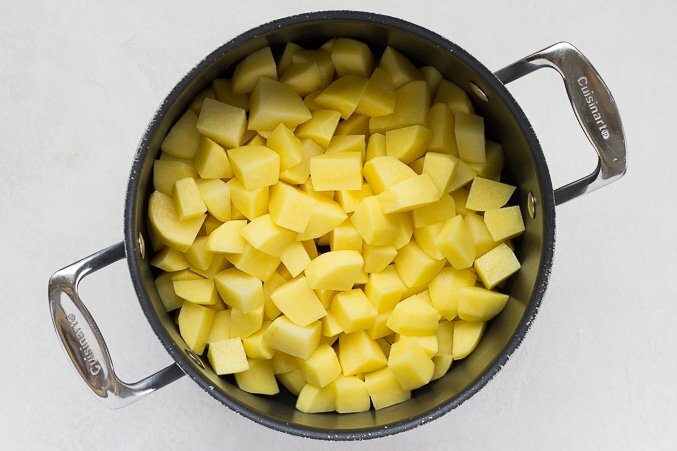 Bring to a boil and cook for 10-15 minutes, until the potatoes are tender when pierced with a fork. Drain the potatoes in a colander. 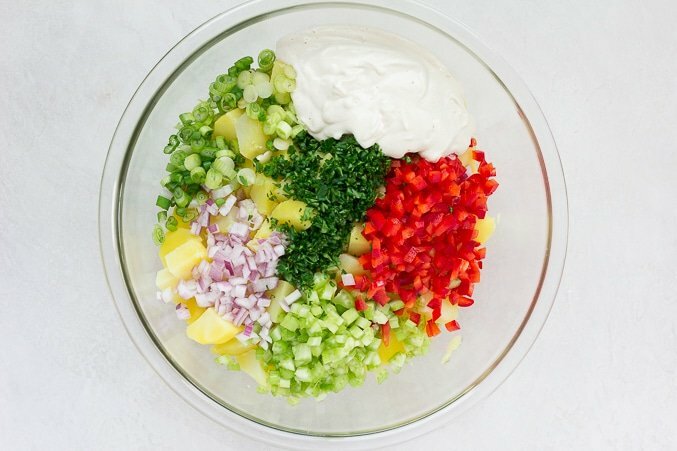 In a large bowl, add the potatoes, red pepper, green onions, celery, red onion if using, parsley and cashew mayo. Mix until well combined with a large wooden spoon. Add salt to taste. Cover and refrigerate for a few hours to allow the flavors to blend and to cool. Serve cold or at room temperature. You can sub vegan mayo if you like (I like the brand Just Mayo, or Vegenaise). Just know it won't be oil free anymore. If you do this, I would suggest still adding the ground mustard to the mayo for flavor. I like yukon gold potatoes the best, but you can switch it up with red skinned potatoes, or even russets. Sometimes I like to leave the potatoes unpeeled. You can vary the veggies depending on your tastes. Feel free to omit anything, or add other crunchy chopped veggies you may have on hand. 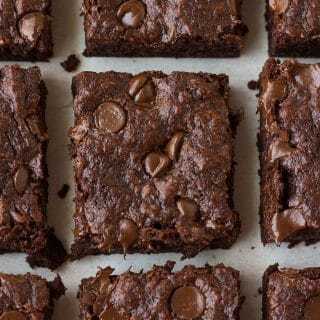 *This recipe was originally posted in March 2017. I updated it with new photos and writing March 11th, 2019.